Trip to the China October 2009. Land just after midnight in Dubai. Have a wander round the duty free shops. Take off at 02:50 on a 777 for the 8:40 hour flight to Pu Dong. Land at 15:30, raining on arrival. Robert is there with Esther, Peter and John. Lydia has had a better offer. They have a new driver called Jacky. Call by at the Y.H to see Stephen and get the train tickets for tomorrow. Pick up K.F.C for tea. The jet lag kicks in at about 8pm. Awake at 3am. Jacky comes round at 9am and we all go to the train station. Catch the train to Tai'an. The construction of the new Shanghai to Beijing railway is progressing well. 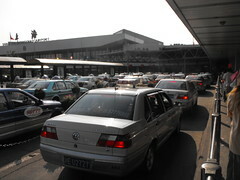 We take a couple of taxis to the Dongyue hotel. We explore the hotel and find the bowling alley and the swimming pool. Eat in the hotel, It is rather difficult to order, but good food. Peter and John wake up at 6am. Breakfast in the hotel, egg fried rice, noodles and fried egg. All eaten with chopsticks. 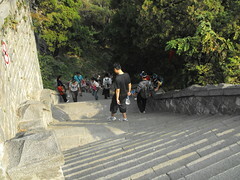 Get a taxi to the bottom of the steps, start walking up Mount Taishan at 10:30am. I had contemplated wearing jeans, but glad that I did not. Very interesting walk past lots of pancake shops and others. Very good regular steps. Stop for a rest and have Melon and egg pancakes. Arrive at Midway at 14:30. We have not got time to walk to the top so get the cable car, it is not as cold as expected on the top. We get the cable car down to Peach blossom garden, then taxi back to Tai'an. Quick change at the hotel and then into town for KFC. Esther 11th birthday so we have cake later. Bed for 10:30pm. I wake at 3:30am and just lie there. The boys sleep till 7am. Breakfast of rice and fried eggs again. Taxi into town, to the church, German built, very interesting. A wedding is just starting. Walk through the Dai palace, nice enclosed gardens. Walk though an open market, taxi back to the hotel. Have a go in the swimming pool, good for diving, a bit cold. Taxi to McDs and then back to the bowling alley at the hotel. We try to get the buffers down at the side of the lane, but they do not work. I tell my Liberal party joke which I heard on Radio 4, What do we want? Moderate progress, When do we want it? In due course. Robert finds it as funny as I do. Sleep till 5am. 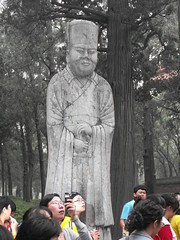 Get a taxi to QuFu, the birthplace of Confucius. Go round the town first. Have a trip in a horse and cart round the town. Have a spin round the forest in an electric vehicle. Eat at the youth hostel. Up, pack, 2 hour taxi ride to Jihan airport, fly to Shanghai. When we get back go to Carrefour and Decathlon, to choose a bike for Esther. Meet up with Lydia, Watch "Seven years in Tibet", I fall asleep at the end. Bit of a lie in, porridge for breakfast. I cycle to Decathlon, Lydia and Esther go in the taxi. I cycle back with Esther on her new bike. Robert attaches the Mongoose and we all set off for a ride. I go on Heathers bike. Very interesting to see how close the poor housing and paddy fields are to the compound. Stop for drinks at a local shop and then we all try some sugar cane. Back for 2pm. Jacky, Robert's driver is getting married. We go to the Ramada, sit on a table with Mr Hu, Robert bosses driver. 20 course meal, crabs claws, jelly fish, duck, tiger prawns, duck soup. I get challenged to down a couple of tumblers of red wine by the local joker. Leave at about 9pm. Heavy rain all night. Headache wakes me up at 2am, cannot get back to sleep. All up at 7am, taxi at 9am, catch the 10:42 train from Shanghai, as before. Clear weather, 26 degs C, I watch the scenery and then sleep. 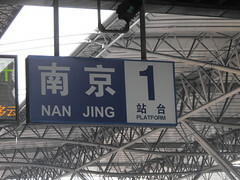 Arrive in Nanjing after 2� hours. 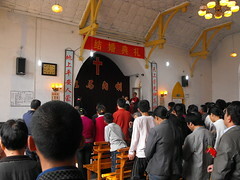 Take the subway and then walk past the drum tower to the Jingli hotel. See the Nanjing Greenland Financial Center, 12th largest free standing structure in the world. Check into the Jingli hotel. Set off for a walk round town at 3pm. Wander down some back streets and eventually find McDs. Go into the main park and hire a water craft. Almost dark when we come off the water, back to the hotel. Wander down back streets again and get some noodles for tea. Eat a very good western breakfast in the hotel. Take 2 taxis to the Eastern Suburb scenic area. 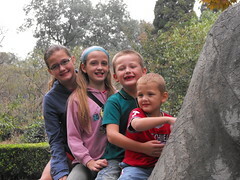 Climb on the top of lots of stone animals, which are guarding the Xiaoling Tomb. At noon start walking to the top of the Purple mountain, Zijin. Arrive at the top at 4pm, great views down to Nanjing, unfortunately it is covered by a layer of pollution. Take the Zijinshan Ropeway down, incredibly long, fantastic journey, takes 30 minutes. Taxi back to the hotel, play Rummikub for the first time. Eat in the western restaurant, using the free tickets, very good, braised beef, spare ribs, etc. More Rummikub after tea. Another great breakfast at the Jingli hotel. Walk down to the some temple. 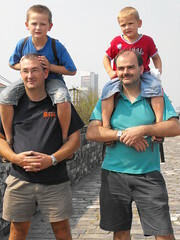 Go up the pagoda, good views across Nanjing, see monks doing their daily chores. Walk along the city walls a little. Unfortunately they do not go as far as they might. Play in a park for a while. Taxi to the main gate of the park for Ice cream. Walk inside the park along an elevated walk way. See parents exchanging details of their children for marriage. Taxi to hotel and then taxi to railway station. 2� hours on the train, reading Mao, the famine years. Fantastic taxi ride through Shanghai. Pizza for tea. Get up at 3:30am, Jacky comes round at 4am to give me a lift to the airport, Robert comes along, all part of the service. 9 hours 20 minutes flight to Dubai. Sleep a little on the plane. See the Burj Dubai as we come into land. See the Burj Al Arab hotel as we are taking off. 7 hours 25 minutes to Heathrow. Home for 10pm.